I hope that the previous post about sweater fit was helpful and inspiring to all passionate knitters out there. My posts are meant to give insight into some of the information out there that I have found most helpful in my knitting journey. So, you decided to knit that sweater (or dress, tank-top, etc.). First of all, good for you! 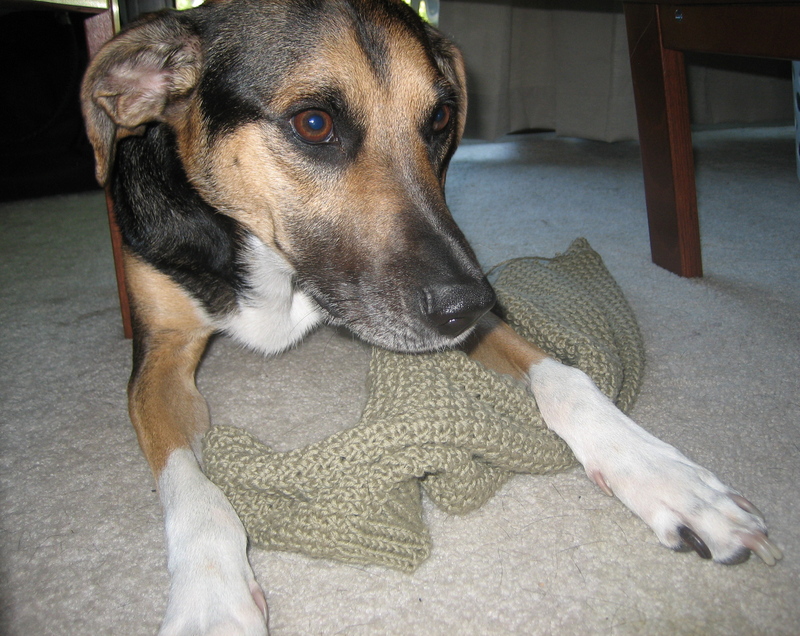 This is a big step in your knitting career and you should be proud of your work! You finally finished, *hallelujah! * and are now laying out all the pieces, however many there may be and… now what?? Chances are, your garment will require some (now take a deep breath) seaming. Even if you are creating something with a top-down construction you will likely have to endure some type of finishing requiring a tapestry needle. This guide is meant to serve as a reference for some common ways to piece together a professional-looking handknit garment. Once again, this is not all encompassing. 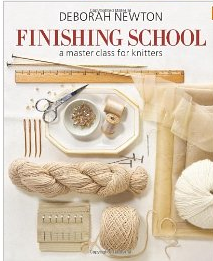 If you are looking for a more complete reference material, may I suggest Deborah Newton’s book Finishing School: A Master Class for Knitters. This book contains patterns, but they are mainly meant to serve as mini-workshops on demonstrations for common finishing techniques. Her advice in the book is quite invaluable. What is her best piece of advice? Think about finishing before you begin your garment! *Groan… well, once you begin gleaning information about finishing (from my post or any other source), you will begin to see that there are certain techniques where the item itself was designed to be put together a certain way. At the very least READ your pattern through TO THE END! Hopefully, the designer will have done this thinking for you and you can better visualize how the pieces will come together. Once you have had some experience, you will begin to understand how you can make simple modifications to create the type of seam you prefer. OK, now on to the good stuff. I will attempt to explain some of the most helpful techniques I have come across and when to implement them. The goal was to have a post with all main finishing techniques in one handy location. 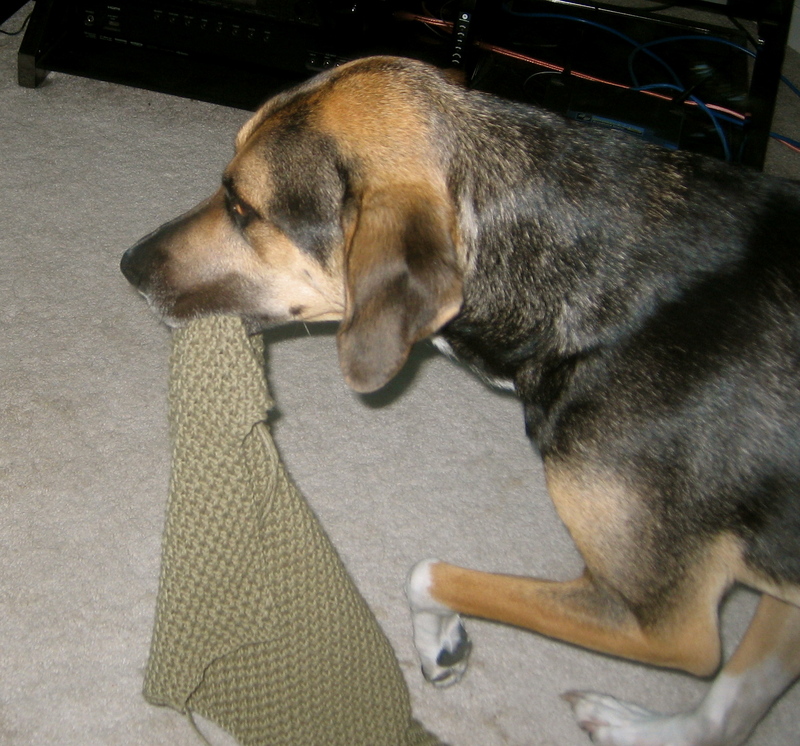 OK, maybe I have the only dog in the world that loves yarn as much as I do. Blocking basically means washing, or at least steaming, a piece of knitting and then laying it out flat to shape it. Yes, that is all it is. It is particularly important to do this before seaming if you have several pieces that are meant to be “flat”, i.e. – a front, a back, sleeves, etc. You will probably have to do this again once your item is completely finished, and some knitters prefer to wait until the very end, which is fine too, but I think that it is easier to line up seams while the garment was tamed a little bit. Since this subject has been written about many times by authors much better than I, I have included some references for how to block. This does not have to be such a complicated process though, if you are using a type of wool or blend, even a quick steam with an iron or garment steamer will help tame your items. Why should you block and how? Notice first, that the top stitches along the shoulder seams are open or “held” stitches, and that the other areas that need to be seamed are the sides and the shoulders (unless the sleeves will be picked up later). Let’s focus on the shoulder seams first. The shoulders of a garment carry the bulk of the items weight, so they should have a very sturdy seam along them. Notice that these stitches are also HORIZONTAL (they run North-South along the garment, but they will be stitched perpendicular to this direction. If you have open stitches (such as those pictured above on the holders, these are also called live stitches), there are two main techniques for seaming them together: 3-needle bind-off, and grafting. 3-Needle Bind-Off: This is my preferred technique for shoulders especially, it is very sturdy, but also leaves a distinct ridge or seam along the inside of the work. Also, (hooray!) no tapestry needle required. Grafting: This is another way of seaming live stitches together. It is not as sturdy as a 3-needle BO, but it creates a seam that is practically invisible. 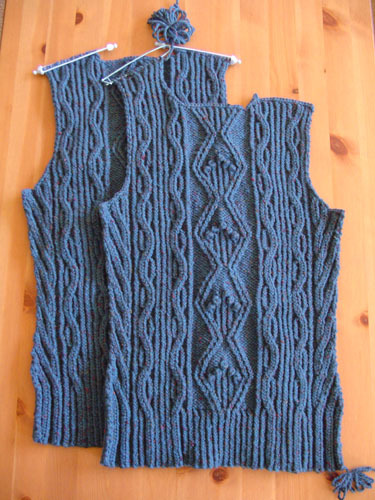 It looks as though the two finished pieces you seam together are continuous knitting! This is usually done with Kitchener stitch. There are two main ways to do this, depending on whether your fabric has a stockinette or a garter stitch on the right side. Note that her working yarn is coming from the back piece that she is seaming together. The main take-aways are: go under each “V”, alternating top and bottom pieces, and always beginning the next V where the previous one ended. Now, you need to know how to seam up the sides of your garment. There are many different ways to do this, depending on how you want the seam to look. The most common method is called mattress stitch. Mattress Stitch: This is a great way to seam vertical pieces of knitting that produces a practically invisible edge. When you are finished, you will also need to pull out your handy tapestry needle to weave in any ends of yarn that stick out from your work. You will simply thread your needle with the end of yarn sticking out and weave in in on the back side of the garment to hide it. There is no rhyme or reason to how you do this, but I like to always weave one direction, and then change directions at least once and weave back the other way. This will prevent the end from coming loose after wash and wear. See, this wasn’t as complicated as you thought, right? Do a quick search online for other explainations or methods that may clarify things for you as necessary. You are on your way towards that perfect handknit garment. Just wait until someone comments, “I love your sweater! Where did you buy it?” Ha! As always, leave any comments or questions and I will do my best to help.